Theatre in Crisis? Performance Manifestos for a New Century is a wide-ranging look at the state of contemporary theatre practice, economics, and issues related to identity, politics, and technology. 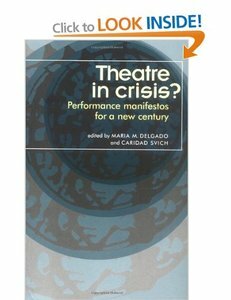 The volume offers a snapshot dissection of where theater is, where it has been and where it might be going through the voices of established and emerging theater artists and scholars from the UK, US, and elsewhere.